The British power-metal band known as Ascension have started up a side project: A cartoon band dedicated to making some rockin’ tunes for little listeners. Yes, in the tradition of Hevisaurus (look it up!) it’s time for Sharky Sharky, the undersea band! Their stated purpose: “”Kids don’t have much to listen to today, no real live bands to look up to. 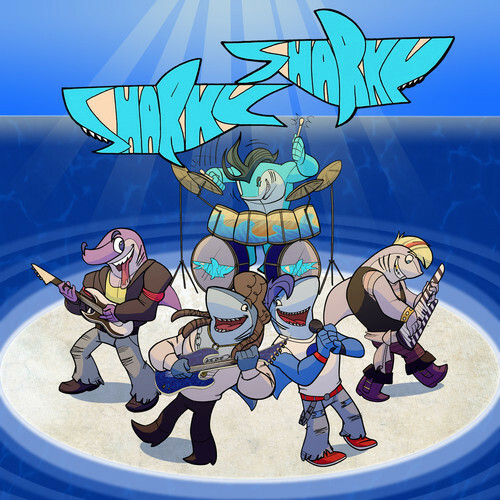 They have One Direction, Justin Bieber, Miley Cyrus…all artists who glorify love, fashion and popularity – all things kids shouldn’t have to worry about right now, especially when enjoying music!” You can check out Sharky Sharky’s first four songs on Sound Cloud, or on their Facebook page. One of the band members is named Jawnofin. Two sharks puns in one name. I think I have died of cute overdose.